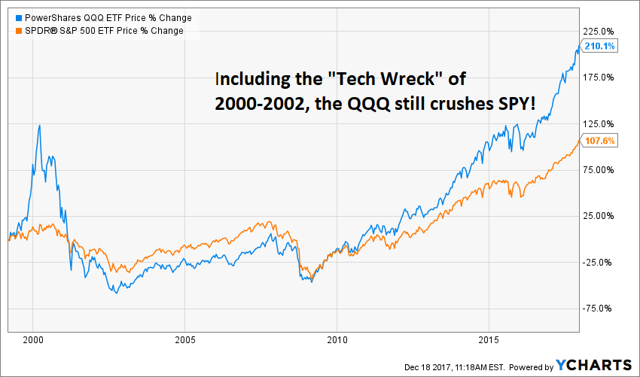 In an age where valuations are high, we are carrying some cash, flash crashes are not terribly uncommon and the next flash crash could be a doozy, I thought it made sense to talk about QQQ again. 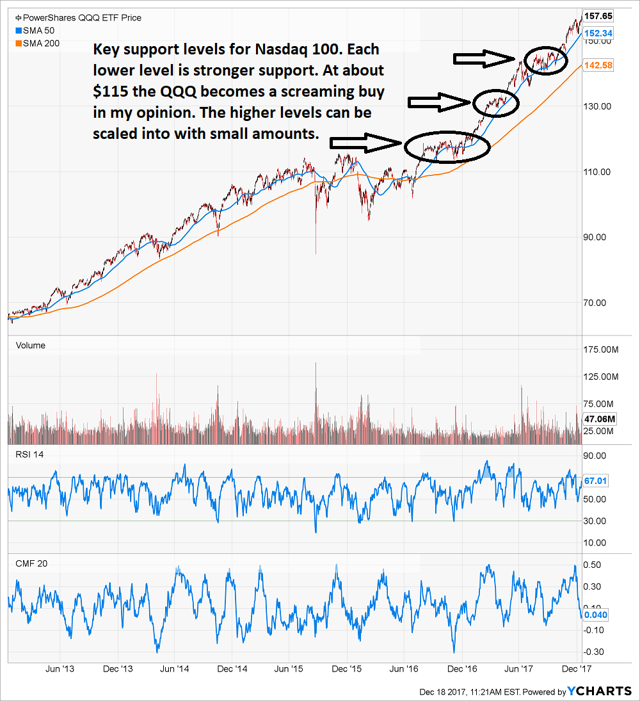 The PowerShares QQQ ETF (QQQ) is the vehicle I use to build a core asset allocation to a group of market leaders and also what I use for a quick buy if the market tanks while I’m not looking. QQQ is my GTC limit buy order. It is the fund that I said is The Only ETF You Need To Start Investing. 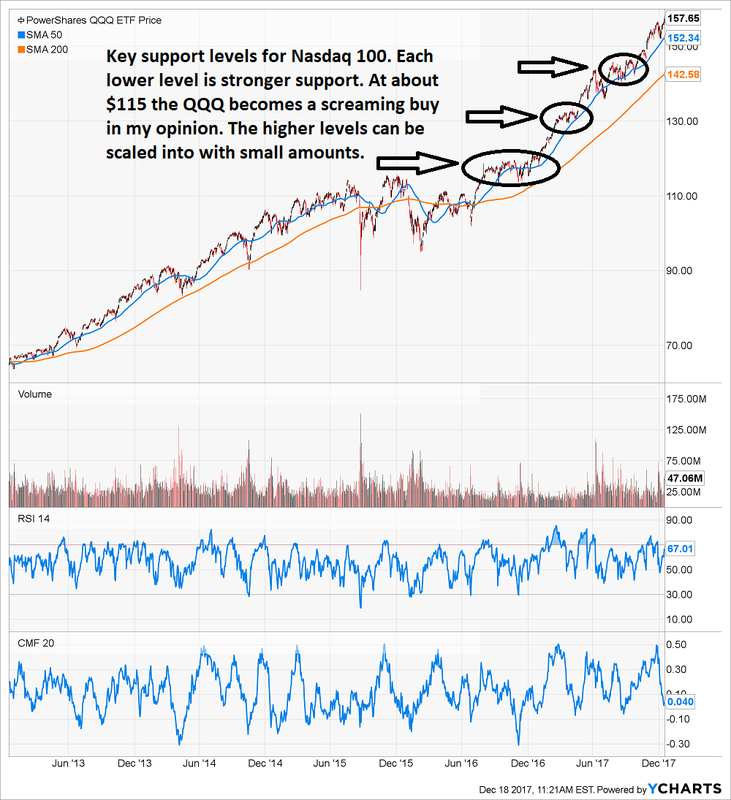 The PowerShares QQQ ETF is based upon the Nasdaq 100 stocks. These are companies like Apple (AAPL), Microsoft (MSFT), Amazon (AMZN), Facebook (FB) and Alphabet – formerly Google – (GOOG) and these make up about 40% of the fund. Other top holdings, in order of percentage of the fund, include Comcast (CMCSA), Intel (INTC), Cisco (CSCO), Amgen (AMGN), Kraft Heinz (KHC), Broadcom (AVGO), Priceline (PCLN), Celgene (CELG), Charter (CHTR), Starbucks (SBUX), NVIDIA (NVDA), Walgreens (WBA), Qualcomm (QCOM), Texas Instruments (TXN) and Gilead (GILD). The Nasdaq 100 stocks have crushed the S&P 500 (SPY) (VOO) over every intermediate and long-term time frame. 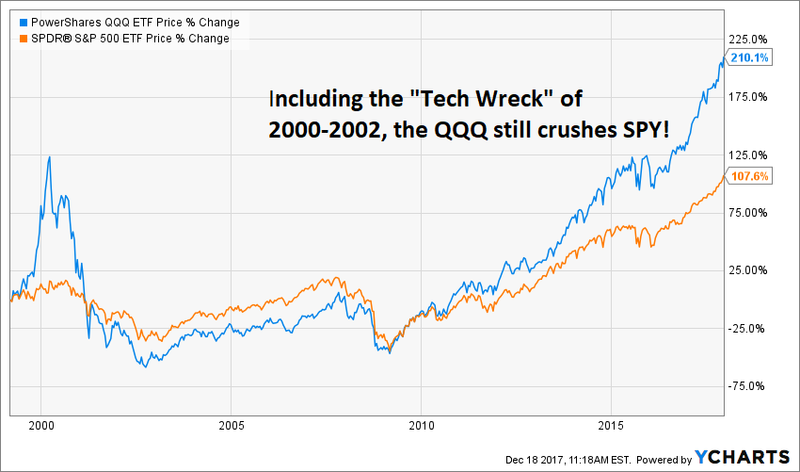 Many investors will point out that QQQ is nearly 60% categorized as technology. I think that’s simplistic. Technology impacts every other sector, thus, the fund is far more diversified than many think. Consider PayPal (PYPL), which is on our Very Short List. It is listed as a tech stock, but isn’t it more finance? There are quite a few examples like that. Is Amazon retail or tech or both? How similar are Apple and Facebook and Google? There is overlap, but clearly major distinctions as well. Could Facebook be consider telecom at this point? Is Google an advertising firm? Investors, in my opinion, need to remember that tech is not just a category, tech is what it does and impacts. I would argue most tech could be co-categorized into another sector. If that is the case, then QQQ is very diversified. I think that is the way to look at it. First off, let’s remember that virtually all (maybe all) of the QQQ companies are also inside the S&P 500. So, QQQ is a slice of SPY & VOO. Why then does QQQ outperform the S&P 500 so much? The simple answer in my mind is that many of the QQQ companies are newer and carry less legacy baggage than companies in the S&P 500, such as pensions and long-term debt on assets. In general, the QQQ companies are less capital intensive than the S&P 500 companies ex-QQQ companies. 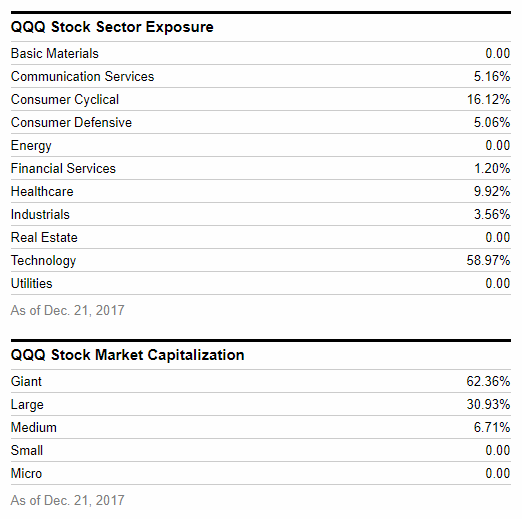 By virtue of being tech heavy, despite impacting various industries, the QQQ companies have lower capital requirements. They don’t have to put a buck into production to get a buck-and-a-half out. Their businesses are very scalable, often making more money with very limited or no additional capital inputs. As anybody in business can tell you, if your business model allows you to provide more services or products with very limited extra expense, that is a good thing. My business is like that. I can manage $10 million, or manage $20 million dollars with very limited additional effort, yet make twice as much revenue. It’s a nice model. If you think about QQQ using Core 4, then you’ll realize that many of the QQQ companies have secular tailwinds on their sides. This is, of course, largely tech driven. So, the big advantage of QQQ companies is that they are generally better growth companies than the average S&P 500 company. Sometimes it is that simple. The QQQ companies grow more. That is the much maligned CAPE ratio for the S&P 500. 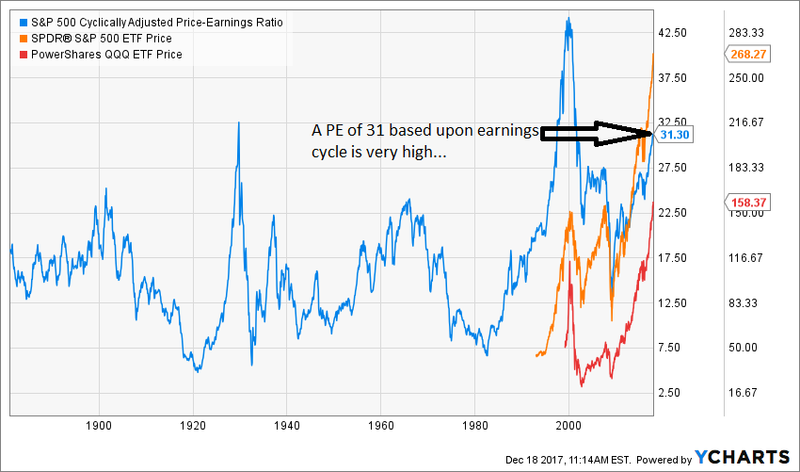 It is an adjusted PE ratio that smooths out earnings over a 10-year period. 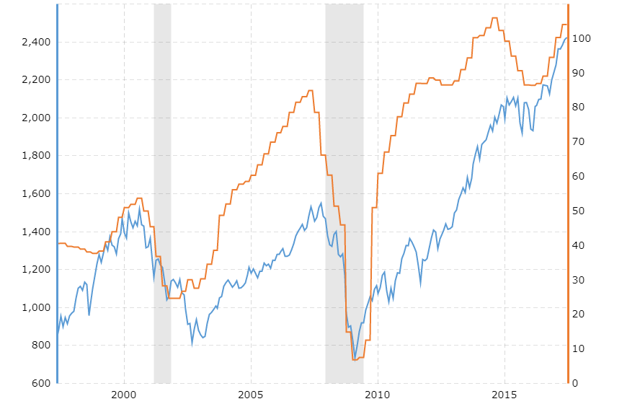 It does that to give a more circumspect view of where stock prices are in relation to average earnings. What we know is that while markets can remain irrational a long time, ultimately, earnings corrections do occur. Whey? 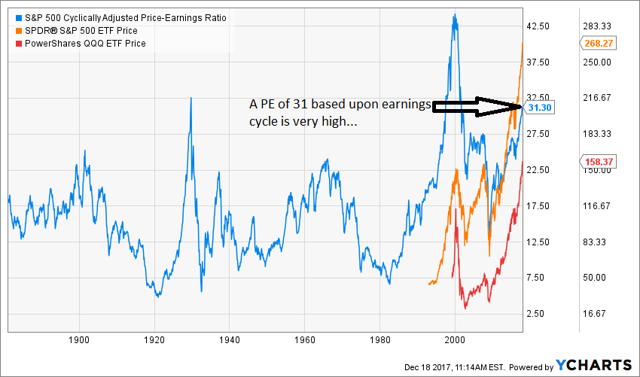 Because it is never “different this time.” Right now, earnings are historically very high. Can we really expect earnings to stay so high? Does it look like a double top to anybody else? Here I would note that the collapsing oil prices seem to have been the clear catalyst to avoiding an steeper fall in earnings in 2015. Today, that catalyst is disappearing, just as interest rates also drift upward. Oil prices and interest rates are very key components to stock market growth. The higher oil and interest rates are, the more likely for a recession. Recessions almost always bring a bear market in stocks. To hedge for high valuations and increasing “black swan” scenarios – in my opinion – I carry 25% of my money in cash very often. I am about 33% cash now. A little less cash for aggressive accounts, a little more cash for conservative accounts. In an age where algorithms can move the stock market fast, it is difficult to put in orders in real time. The use of GTC limit orders is vital. While we can put in orders for a dozen stocks, I prefer one very simple order for sudden events. To buy on the quick, especially if I’m doing something else when the markets go haywire, I simply set two buy limits for QQQ at different support levels. Right now I have GTC limit orders for the QQQ set at $130 per share and $115 per share. I have skipped the first support level altogether as that’s such a small correction I might ignore it. A correction down to $130 represents about an 18% correction off of the top. I think this is a great buy level. 20% is an official bear market and there is huge reason to think there is major investment bank buying of stocks just ahead of that unless there is some significant economic issue. A correction to $115 is about 27% or just short of a typical full cyclical, but non-crash, bear market decline which often clock in at about 30% declines. The just short of 20% and 30% corrections make a lot of sense to me based on history. It is interesting that support levels almost correspond to those size corrections about now. That tells me something about markets right now. Disclosure: I am/we are long QQQ.